My plan for the morning was simply to enjoy my surroundings while riding all of the Blackwater Heritage Trail. Having never biked over 8 miles before and actually not knowing at the time how long the trail is, I wasn’t sure how difficult it would be. I came prepared with 2 bottles of water and a protein bar inside my backpack. With Shawn and the kids, I’ve I never gone more than 3 or 4 miles out where there is a covered area with picnic tables and a parking lot-The perfect rest and snack spot for little riders. But, I wouldn’t be stopping. . .at least I thought. So, it’s 9:00 am. I start riding. The air is a cool 70 degrees. Really. And, wow, it’s August in Florida. It’s the perfect morning for riding. My thoughts start to shift back to my kids, but I remember they went to school happily this morning, so I’m feeling in a good mood. But, I say one more prayer for them and their school before I officially start some much needed “mommy-time”. After the first two miles, I’m feeling quite refreshed. 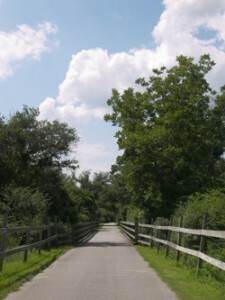 It’s a flat, paved trail that crosses a couple of creeks and passes by small farm houses. There are goats and horses grazing. My only music is the bird and grasshopper songs. The rays of sun that made their way through treetops glisten on the grasses morning dew. There are markers every half mile. I get to Mile 4 and exchange greetings with two other riders who are now heading back. After the 5th mile, however, I’m the only rider still out. The houses sit further back from the trail. The trees become fewer and the grasses taller and thicker. I wind my way up a small hill. I stretch a sore quad while staying on my bike. Then, I’m at the end-mile 8.1. I decide to keep going though. The end of the trail is the beginning of a trail along a road. I get to what should be approximately 9 miles and turn around and speed up my pace. The temperature is rising, but I look up at the blue sky and then at the life all around me and I’m caught up in the moment. As I keep riding, I spot several Viceroys. They are orange and black like a Monarch, but smaller. I set my bike along the fence for no more than 2 minutes while one butterfly lands on my bike. 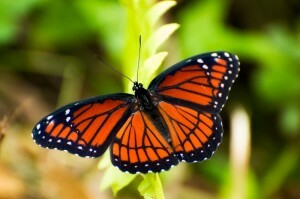 Then, I watch as it flies around me and returns to it’s flowers. I continue riding again and near the parking lot. 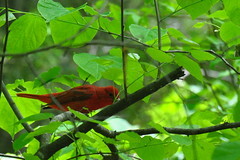 When I turn around I notice a bright red bird flying away into the woods. My daughter picked out Stan Tekiela’s Birds of Florida field guide at the store in Fort Pickens a few weeks ago. We’ve been reading it, but have not been out bird watching. It seemed too bright to be a Cardinal and the head was smaller. I’ll call him (males are always the colorful ones) Summer Tanager. I didn’t have to go to the confines of a gym today. I worked my body fairly hard. I feel more relaxed and better able to relate softly with my children and others around me.